The 2018 Ford EcoSport is new to the USA and the 2018 Mitsubishi Eclipse Cross is new everywhere. Which of these brand new compact crossover SUV options deserves our attention? Read our comparison guide to find out. We'll let you know which new kid on the block is best. The 2018 Ford EcoSport has plenty of tech and an intuitive infotainment system. Standard features include MyKey, two USB ports, six-speaker audio system, and SYNC infotainment system with 4.2-inch display screen. 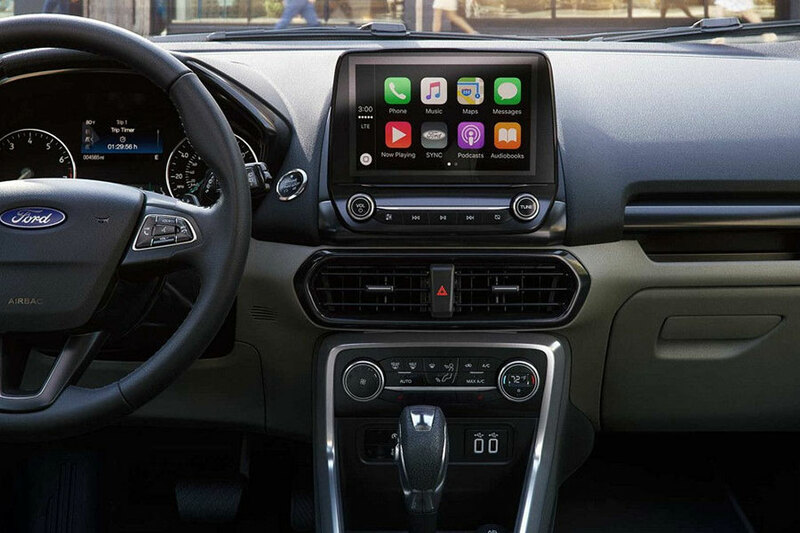 Available features include moonroof, navigation, Wi-Fi hotspot, seven-speaker audio system, nine-speaker premium audio system, satellite radio, and SYNC 3 infotainment system with 6.5- or 8-inch touch screen, Apple CarPlay, and Android Auto. Intuitive controls and physical knobs make the infotainment system a breeze to use. On the other hand, the 2018 Eclipse Cross lacks physical knobs and its infotainment system is challenging for new user to navigate. Standard tech features that include 7-inch touch screen, Bluetooth, HD Radio, and a four-speaker audio system feel a little sparse compared to all that the EcoSport offers. To be honest, it is tempting to call this particular comparison a tie. The EcoSport boasts 21 cubic feet of cargo space, which transforms into 50 with the rear seats down. Meanwhile, the Eclipse Cross has 22.6 cubic feet and 48.9 with seats folded. It's a difference, but it's a small one. However, the Eclipse Cross is twelve inches longer than the EcoSport, which should (at least in theory) give more space for people AND their stuff. We'll give the nod, then, to the EcoSport, for the sheer audacity of matching a compact SUV's cargo space as a subcompact SUVs. Since it's bigger, you would probably expect the Eclipse Cross to have more power, but the EcoSport outdoes it. The EcoSport's secret is in its second engine option, a peppy 166-horsepower four-cylinder that can be added to the base trim, along with all-wheel drive, for just $1500. Even with the extras, the EcoSport still comes in below the starting price of the Mitsubishi Eclipse Cross. The Eclipse Cross delivers just 152 horsepower by way of a turbocharged, 1.5-liter four-cylinder engine. Less horsepower plus a bigger vehicle make for slower acceleration. On top of that, the Eclipse Cross suffers from mushy steering and braking while the EcoSport is a nimble handler that can stop on a dime. Unless you're committed to a larger vehicle for its own sake, there really isn't much reason to get the Eclipse Cross over the Ford EcoSport. Put it to the test and drive one today!